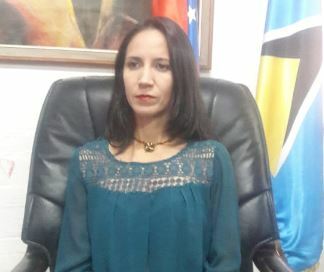 Venezuela’s Ambassador to Saint Lucia, Leiff Escalona, has said that her country is on alert after Tuesday’s earthquake and an aftershock hours later on Wednsday. The magnitude 7.3 quake Tuesday was the largest to strike Venezuela since 1900, according to the U.S. Geological Survey. Venezuela’s Ambassador to this country disclosed that there were no casualties following the quake that struck the East Coast of her country. A strong aftershock jolted Venezuela’s northeastern coast on Wednesday. Two sources at state oil company PDVSA were quoted as telling Reuters that the OPEC member’s refineries and oil fields were operating normally, although PDVSA did not immediately comment. The Venezuelan Ambassador to Saint Lucia said that following Tuesday’s quake, the Venezuela government immediately activated risk management procedures and personnel. “It is important to highlight that our country is a seismic country,” Escalona observed. She revealed that the people of Venezuela, especially in the capital, Caracas, where there are many high rise buildings, tried to remain calm and evacuate. Noting that there was an aftershock hours after Tuesday’s quake, the Venezuelan diplomat explained that local authorities are on high alert to respond. She said some buildings, especially in the East and in Caracas sustained some damage. Tuesday afternoon’s earthquake shook buildings as far away as the Colombian capital Bogota, knocked power out in parts of Trinidad, and was felt in several other countries, including Saint Lucia where it shook a number of buildings in several parts of the country. According to international news reports, the quake’s depth – 76.5 miles (123 km) below the surface – appeared to have mitigated the damage.